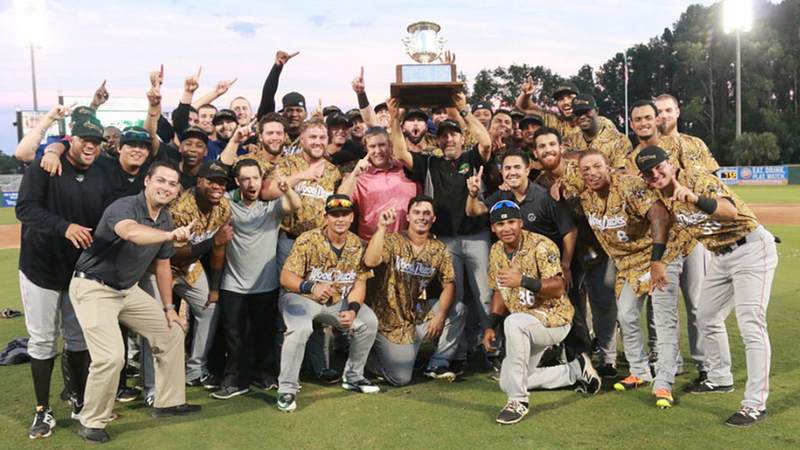 After finishing the first half at 24-45, 18 1/2 games behind first-place Myrtle Beach in the Carolina League Southern Division, Down East exacted some sweet revenge in the Mills Cup semifinals. The Wood Ducks earned a share of the Carolina League championship with a 2-1 win over the Pelicans on Friday at TicketReturn.com Field. The win came in the opener of a scheduled doubleheader, which ensured the playoffs would end Friday as Hurricane Irma bore down on the southeast and forced the cancellation of the Mills Cup Finals. "Obviously, we had a tough first half of the year, but I think some of the stuff with the Rangers that we put in place and the things we were looking to improve on were not concerned so much with wins and losses," acting Wood Ducks manager Steve Mintz said. "Over the last two months, we've seen the things we harped on with these guys. "In the first half, every night we found a way to lose a ballgame, and to watch the guys tonight in a 2-1 game, making plays and pitches when it counted where three to four months ago we weren't able to do those things ... from an organizational standpoint ... it's overwhelming." After Myrtle Beach opened the scoring in the bottom of the first, Down East tied it in the second when Preston Scott scored on a throwing error by catcher Tyler Pearson. Matt Lipka led off the third with a homer to left-center, his second in as many days, and three pitchers tossed 4 1/3 scoreless innings in relief of starter and Rangers No. 10 prospect Brett Martin. "Martin wasn't as sharp as we'd thought, but he kept them to one run and Emerson [Martinez] got us six outs," Mintz said. "[Jeffrey] Springs came in and got the big out with the bases loaded and we went right with Scott Williams and we prepared to keep him out there. Had to get [Cubs catcher Willson] Contreras for the last out of the game, so it got pretty interesting there with a 2-1 ballgame." Martin allowed one run on five hits and two walks over 2 2/3 innings, leaving with runners on first and second before Martinez got Jesse Hodges to ground to second to end the third. Two innings later, Hodges lined to right against Springs with the bases loaded to end the Pelicans' best threat. Williams took over for the final two frames, striking out one and walking one while extending his scoreless streak to 30 innings. He was the first Wood Ducks pitcher to retire Contreras, who had a hit and two walks in his first three plate appearances. "Everybody's super-excited now. We made a pretty magical run here at the end of the season to even get to this position," Mintz said. "To finish it off tonight, the boys were just unbelievably excited and happy. Not a lot more to say about it."